This 2013 ALDOT project was along a 7 mile stretch of I-459 between US Highway 280 and Grants Mill Road. Major items of work performed on this project included planing of the existing asphalt travel lanes and paved shoulders, the installation of Stone Matrix and Superpave asphalt wearing layers on the travel lanes and paved shoulders respectively, the addition of a concrete glare screen to the existing concrete barrier wall, and the removal and replacement of the existing steel beam guardrail. Other items of work included installation of topsoil and sod along the shoulders. Due to heavy traffic, working hours for planing and resurfacing were limited to 7:00pm to 6:00am. Also due to the large volume of traffic, safety was a major concern. Work not requiring a lane closure was allowed during daylight hours. Therefore, supervision was required virtually 24 hours a day, and scheduling subcontractors for all phases of day and night work was critical in the successful completion of this project. 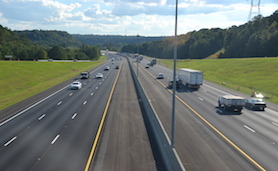 This project won the Alabama Asphalt Pavement Association Award for 2013 for the Multi-Lane Highway over 50,000 tons category, and also was acknowledged by the National Asphalt Pavement Association with a excellence in pavement award.